As I read the list of endangered languages published by the United Nations Educational, Scientific and Cultural Organization (UNESCO), it perplexed me when Western Armenian was categorized as “definitely endangered.” According to UNESCO, “definitely endangered” means that ‘children no longer learn the language as mother tongue in the home.’ Currently there are only 200,000 people who speak Western Armenian. However, according to the most recent UN data, the number of Armenians in the diaspora is 6-7 million. A nation’s identity, its culture, its values, and the preservation of its heritage is dependent on its language. Armenian is no different. It should not be “optional” to teach Armenian to our children, but rather intentional. It may be a struggle but not impossible. According to the University of Washington’s Institute for Learning and Brain Sciences, ‘optimal learning’ is achieved when children start learning two languages between birth and 3 years of age through high quality interactions with live human beings’ (Authors Patricia H. Kulh, Ph.D. and Naja Ferjan Ramirez, Ph.D.). Simply put, the best way to teach our mother tongue is with face to face interaction. In addition, there is an infinite number of learning tools such as DVD’s, CD’s, audio books and multimedia sources that can be used as supplements and help introduce our children as well as adults to our mother tongue. The fruits of our labor will not be seen or heard spontaneously, however. Instead, after many months and years, a committed and determined parent will see their child (or children) has achieved a level of fluency and proficiency that is sufficient for formal or informal conversations. The emphasis is on commitment and attitude. The attitude must be one of intentional daily teaching, even if it is for ten minutes a day. This, however, is not limited to parents of young children. Adults of any age, Armenian or non Armenian, can learn Western Armenian, given today’s technologically rich era of multimedia and social media. One may ask, ‘How long does it take to learn a new language or your native language?’ From my own research, thirty minutes per day for two years will give a comfortable level of fluency. Again, be mindful that Western Armenian has been demoted to “definitely endangered.” This can be reversed if the diaspora has a unified, intentional goal of preserving the heart and soul of our language, and ultimately, our nation. Many would argue they don’t have thirty minutes to spare each day. Yet without thought, the average daily use of social media is over two hours. Yes, it takes discipline and living with purpose, but at this low point in our history, we have no choice. In fact, it is our responsibility and privilege to our next generation. It’s up to you . It’s up to us. It is never too late, and it is never too early to learn and preserve Western Armenian. None of these facts actually matter to the government or people of Armenia. They’re more versed in Russian than their mother tongue anyway. They even go out of their way to discourage the western dialect. It’s a left over mentality from the Soviet era. The tragic part is that the offspring of the 1946-47 emigrants to Armenia are at the forefront of denying their ancestral dialect. In their rush to assimilate, they’ve all but trampled over the history and memory of their forebearers from western Armenia. If Armenia was truly inviting to all Armenians, they would have included western Armenian as the official language in the constitution already. They could have encouraged its preservation by gradual reintroduction through the educational system and official publications. But as usual, corruption and apathy has trumped all things positive in Armenia! The Western Armenian dialect will not survive without the official endorsement and financial, moral, cultural, and historical support of the Armenian government. The Armenian government must spawn new books, cartoons, toys, games, videos, websites and more to attract Diaspora youth, but it is not in a position to do so at this time due to revolutions, high unemployment, corruption, and so forth. The Armenian day and Saturday schools are competing against the powerful forces of assimilation but are losing to the culture of their adopted nations. Many Armenian families are not speaking Western Armenian in their homes, with their children, which is the best and most significant way to pass on a language from parents to children–and these are parents who intentionally send their children to Armenian day and Saturday schools to learn how to speak, read and write (Western) Armenian. Sad. Saving Western Armenian must begin in the H O M E.
Can you provide the citation for this information you stated in the article : “Currently there are only 200,000 people who speak Western Armenian.”? There are less western Armenian speakers in the world than eastern, but 200K still sounds a bit low. Actually, no. The word is սորվիլ (to learn) in Western Armenian and Mesropian (traditional) orthography, which is conjugated as it is seen in the photo. Սորուիլ (սորել) means to run, to flow, to glide along, or to leak. For a comprehensive treatment of this subject see my lecture “Armenian Culture in America: Dead or Alive? Thank you for submitting your lecture. We only have to make a commitment to speak our own language. Once this commitment is made, culture will never die. Western Armenian must be adopted as the official language of the Republic of Armenia and thought in schools. The Easrern dialect has too much Persian and Russian influence to the point that it can hardly be classified as Armenian. That does not make sense. It is like saying Western Armenian has too much Turkish influence just because some Turkish words or phrases were adopted by Armenians in remote Armenian villages in occupied Western Armenia and passed down to their next generations. The Armenian language, Western or Eastern, exists in spite of any foreign language. 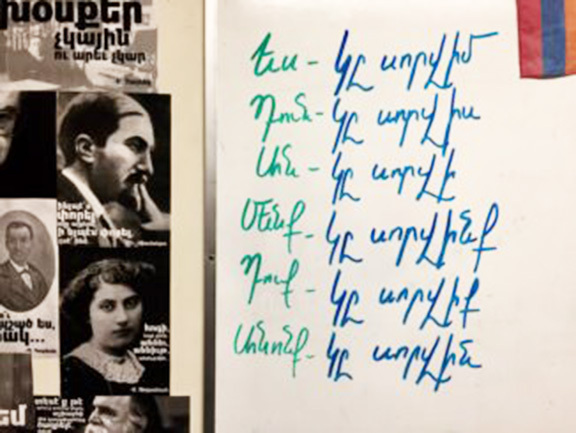 If a language is misused by average speakers by adding foreign words to their Armenian vocabulary, or using them instead of using their Armenian equivalent words, that does not mean a particular Armenian language is less of a language. It means the average Armenian speaker either lacks proper knowledge of some or certain Armenian words, thus replacing them with foreign words, or does so by force of bad habit. Besides, how do we know those “Persian” words don’t have Armenian origin in the first place and that they were adopted by them instead of the other way around? As far as the Russian language is concerned, we can safely say it was forced upon the Armenians for seven decades. What’s needed is proper Armenian education to root out foreign words from the Armenian vocabulary. That of course is easier said than done because such words have been used by many generations over the centuries and that primarily because of unavoidable cross-cultural influences. What happened many generations ago in terms of adopting some foreign words in our day-to-day conversations is now happening in the United States. Those foreign words used by our former generations are being replaced with English words by newer generations. We have no one to blame but ourselves for this. We need to do a much better job! No wonder I’m having a hell of a time understanding the Eastern dialect. Some words don’t even sound Armenian. Kartofil, pomidor, marshutni, zontik, konkret, sinism (cynism), senar (cenario), informatsia (information), normal, corruptsia, policlinica, rector, registor, compositor, finansavorel, beezness (business), texteel (textile), transport, skandal (scandal), norm, team, offshorayin (offshore), textov (by text), & more. None of this is Armenian, but in Armenia it’s too common. A comprehensive dictionary; English – Armenian by Kouyoumdjian is a wonderful source to put to rest what is or is not Armenian. The concept is simple. Let’s use our resources. Let’s teach ourselves if nobody will teach us. This is possible and do able. We were not born Armenian so we speak everaybody else’s language. The language is ours and let us treat it as such. We were born Armenian to preserve a gift which is precious. Give our next generation the same gift, but perfected.